Packed full with camping gear, food, and clothing to last five nights and four days, the truck looked ready for anything. Which is good, since all I knew was to expect the unexpected. A good time, sure, but past that was anyone’s guess. After a two-hour drive, and a quick rendezvous with friends, we caravanned to our final destination: early bird check-in at Electric Forest. I could feel the excitement building as soon as we exited the highway – cars all headed in the same direction for the same purpose. A few turns later, there was the line – already some hundred-deep waiting for the gates to open. A seldom-used two-lane road with cars parked courteously off to one side. Immediately I could tell this was going to be a different experience altogether. People standing outside their cars, sharing a beer, waving hellos and flashing peace signs to other passing festival-goers heading to the back of the line. No cutting or speeding or honking, just an orderly amiable idle to get in line in due time. Finally the gates opened and security began the arduous task of checking thousands of cars for entrance into camp. The wait turned long, but spirits remained high as cars crept along the dusty road towards the grounds. Passengers got out of cars and ambled down the road, keeping everyone informed about the progress ahead, saying hello, meeting new people. A flurry of slamming car doors, clanking tent poles, pounding stakes. Afternoon quickly turned to evening and things were underway. Still waiting on a few members of our group, we braved a speedy, bumpy, and harrowing golf cart ride to a welcome party on the other side of the ranch. Through back lanes and bogs, we emerged to find an old West-style village in the middle of nowhere, complete with two swimming pools and a water slide, but of course! Free craft beer, pulled pork, and fixings to soothe travel-weary nerves were just the ticket. 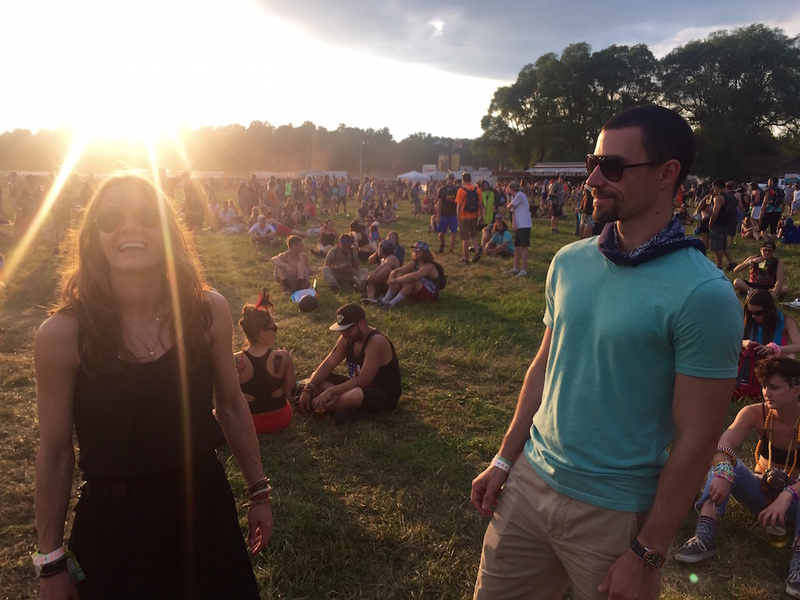 Electric Forest is about meeting friends new and old – my travel companions had the immense fortune of bumping into their forest family of years past, who insisted we move camp and join them. Our group of five grew to a rowdy thirteen. Complete strangers welcomed me with open arms, making sure there was enough room for everyone’s tents, cars, and belongings. “Pull up a chair, have a drink, happy forest!” they cried. The first evening drew to the best kind of close – a hazy, late night with delicious anticipation of the days ahead, on the cusp of greatness. The lesson to expect the unexpected – and be open to the possibilities of the universe – was just really beginning. Heading to bed somewhere after two a.m. the first night, accompanied by the sounds of electronic music from just across the lane, there were slivers of doubt. “How am I going to get any sleep like this for four more nights? This isn’t camping, look at all these tents – this is a slum. What have I done?” Earplugs were no match for the waist-high speaker and subwoofer that showed no signs of slowing down, even as the clock rounded 4:00 a.m. But by night two, a funny thing happened – sleep came on it’s own, the body exhausted from walking, dancing, and living in the outdoors. The deep base fading into the background, more white noise than nuisance. Walking into the Forest for the first time was magical; truly something from a fantasy story. Towering pines lined wood-chipped paths that wove through the grounds. Art installations, small manicured gardens, and no end of oddities dotted the landscape – an elaborate vanity table, an antique library! Through the muffled quiet of the loamy forest floor there were sounds of an electric violin and enchanting accompaniments. In a small clearing was a stage with intricately carved viewing platforms all around – no longer in Northern Michigan, we were in the courtyard of an ancient Chinese pagoda. On stage was a silver-haired man in white tunic and green Shantung pants, playing the violin passionately, pausing now and again to gently impart sage advice and comment on the beauty of the forest and our days ahead. Wonder and awe. As darkness closed the volume in Forest went up. From whimsical play land to a madcap fun house of spectacle – the trees, the art, and the people themselves were lit in Technicolor. Bass could be heard coming from all corners of the ranch, pulling revelers towards the pulsing light and sound. This is what we’d been waiting for, and the dancing commenced. Bedtime came somewhere in the neighborhood of five o’clock, with black night fading to grey. Routine was quickly established. No need for an alarm here: blazing morning sun heated the tents in no time, sleep hot and fitful by nine. Utter quiet remained as campers slowly eased into the day. Crawling out of tents, all manner of pajamas and bleary eyes greeted the day. No longer strangers – but neighbors, villagers together. Late mornings lazily crept into afternoons, and were spent preparing a leisurely brunch for the group, walking around the village, taking a hammock nap in the forest. Again each night after dark, the forest filled with bodies drawn from camps and forest nooks, each following the Siren call of speakers three stories high. Artists were transformed into conductors of intricate bass lines and laser shows, each out doing the last, night after night. The forest family’s collective skin hot against cool air, awash in color and light, dancing until dawn. Four and a half days. And somehow, still not enough time. I cannot wait to expect the unexpected, once again. Until next year, Electric Forest.